6 Minute Read: Yoga, women in business, manifestation, intention, passion. 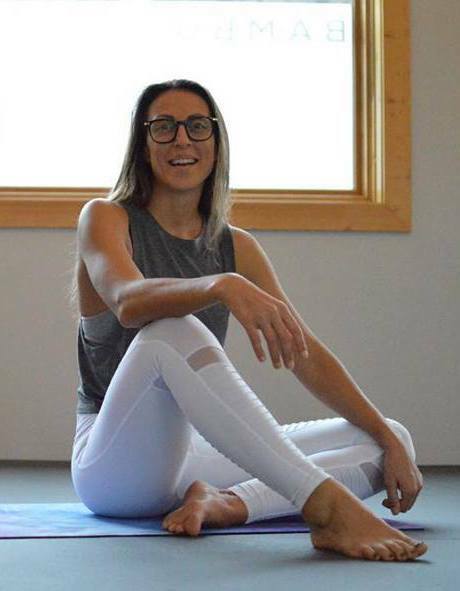 Kaila Kaufmann, owner of Bambu Hot Yoga in Nelson, British Columbia, is one of the kindest, most genuine people I know. I’m a regular (daily!) student at her studio and always leave her classes feeling more present, more connected, more supported. Kaila’s strong yet gentle presence infuses the studio community, and she truly embodies the steadiness + ease of yoga. Her class this morning was delicious (handstands – yay! ), and I’m delighted to interview her in this space. Below, Kaila talks about the role of yoga in her life, self-care + self-acceptance, intention + manifestation, and what to look for when you’re new to yoga. Enjoy! Please introduce yourself + your business! My name is Kaila. I’m a single mom of an amazing 12-year-old boy named Amani, business owner, yogini and teacher. Bambu Hot Yoga is the premiere hot yoga studio here in Nelson, BC. We offer infrared heated and non-heated classes in various styles suitable for all levels, as well as workshops, retreats and Yoga Alliance accredited teacher trainings! I wanted to create a welcoming place that is a refuge from daily life – a zen place to find calmness allowing for self-study. Could you talk about the role of yoga in your life? Yoga has been present in my life since an early age. My father always talked about practicing hatha yoga with his mother as a child back in the ‘60s, in South Africa. So he introduced me to meditation at a young age. When I was 11, a family friend gave me The Autobiography of a Yogi. Although I never read the whole thing, it definitely played a role in my deeper exploration of yoga as a young teenager. Yoga has honestly given me everything I have, and I am so grateful for this humbling, ever-growing and expanding practice. This practice has helped me heal and get through so much in my life. It continues to present the opportunity to grow, which to me is the purpose of life. Does yoga support body love + acceptance? Yes. I think most women struggle at some point in their lives with not feeling at home in their own skin. It’s a byproduct of Western culture. To me, yoga is nonjudgmental. Yoga does not care about your size, shape, gender, background or skin colour. Because yoga was brought from the East to share with the West, I truly feel it is a path that allows deep healing and transformation for the practitioner. Like anything popular in modern days, it gets exploited (as you can see, if you search #yogisofig on Instagram). That said, in anything you have to navigate to find what’s truly real. How about self-care + self-nurture? The backbone of yoga is the 8-limb path, or “8 limbs of yoga,” which offers tools for self-care and regulation. I think it’s important for the practicing student to also study the philosophy of yoga, getting to deeper truths beyond the physical experience. Do you find rituals or routines helpful? To me, sleep is everything!! Seven to eight hours is optimal for me to feel 100 percent. I love to practice a new moon ritual of setting intentions and goals for the month ahead in my journal, along with a daily pranayama and meditation practice. What mantra is most alive for you right now? For me, being present is a daily practice! Owning a business is something that is hard to switch off from, and when I’m spending time with my son I don’t want to be distracted. I want to make him feel like he has my full attention and that he matters 100 percent – these years are so precious. Repeating the mantra “I trust and I have no fear” has been the theme of the last few years. The trust practice comes from simply moving away from fearful thoughts and feelings and moving towards loving ones. What advice would you offer someone new to yoga or curious to try it out? Find a teacher you resonate with. Honestly, the teacher can make or break yoga for new students. Research the class you’re interested in and make sure it’s a good level and fit for a beginner. If you’re unsure, ask the studio for help deciding. Ask a friend to go with you – the buddy system makes it less intimidating! Come with an open mind and heart. Know that yoga is not a place for judgement towards self or others. Yoga is a place of acceptance and nurturing. One of the yamas is ahimsa: non-violence. What advice would you offer women in business or others wanting to pursue heart-sourced passions? Omg, this is huge. You have to just go for it! Again, it’s the no fear!!! Find a mentor who believes in you – someone who has been through it. Honestly, I think what holds women back from doing things is people telling them they can’t and/or not believing in themselves as powerful beyond measure, or the fear of failure and it not working out. But I truly believe that attention is everything. The more attention you give to anything, the more it grows. This is true for relationships, businesses, bank accounts, self talk, your garden, everything!! Work towards what you want, be consistent, be resilient (you have to get back up if you fall!! ), and don’t give up – you’ll get there I promise! The universe works in mysterious ways, but I truly believe in the power of visualization and manifestation. With that, being very clear about what you want to achieve is super-important. The universe needs clear signs from you to be able to work for you. Know that you can do and be anything you desire. Feel yourself there and visualize that. My first yoga teacher always said: “Fake it til you make it, baby!” :), and it’s so true. If we wait until we feel ready or feel accomplished to do these things, it’s often too late! And the truth is no one feels accomplished when starting something new. If you were already accomplished and there was no fear, there wouldn’t be much reward! How can people find you and learn more? Bambu Hot Yoga is located on Baker Street, in downtown Nelson, BC. You can also find us on Facebook and Instagram. Thanks so much, Kaila! You are such an inspiration! See you in class!